This leaflet was adapted from one published by the Rochester, New York, Political Equality Club and was distributed by the Good Government Club of Topeka, Kansas, in support of the upcoming vote on a state constitutional amendment giving Kansas women full voting rights. The leaflet includes the full text of the resolution passed by the Kansas legislature to place the issue on the November 5, 1912, ballot. The pamphlets includes what are titled "A Few Leading Questions." The answers to the questions illustrate the inequities of the current system from the female point of view. 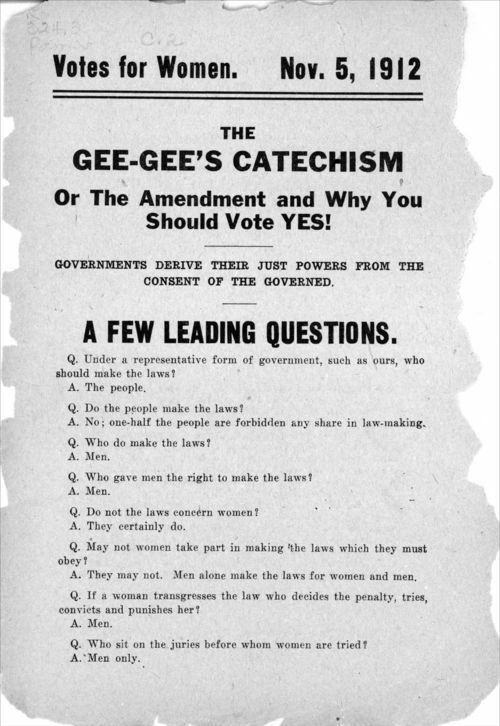 The Gee-Gee's catechism, or the amendment and why you shoud vote yes!